Blackcap is a common summer breeding visitor in much of central and southern Scotland including Arran. A distinctive greyish warbler, the male has a black cap and the female a chestnut one. Its delightful fluting song has earned it the name 'northern nightingale'. In the winter time birds from central and northern Europe head for southern Europe and North Africa, usually leaving around September. In the 1970s over wintering birds started to appear in gardens in some parts of Scotland including Arran. 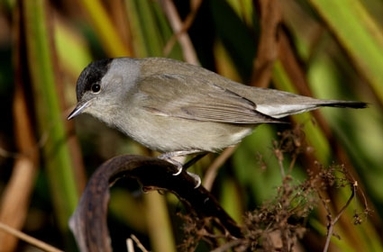 Studies of ringed birds have shown that these wintering Blackcaps are not the same birds that breed here in the summer. The Arran breeding Blackcaps are still migrating south for the winter. Where are these birds that are seen in the winter coming from? 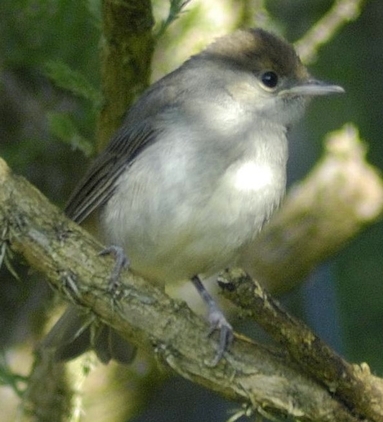 The increasing winter populations in the UK have been traced to a tiny population of Blackcaps caught in Germany which exhibited a tendency to migrate in a north-westerly direction (instead of the majority that migrate southwards across the Alps to Africa) - the combination of more food and milder temperatures in Britain means that the birds that migrate from Germany to Britain are now apparently at an advantage over those migrating south. It has been postulated that they are spared the long flight to and from Africa and in mild winters their overwinter survival rate may be relatively high. They may also gain better breeding grounds and territories as they return earlier in the spring than the birds that winter in Africa. In the summer time Blackcaps eat mainly insects but in the winter they eat berries and find fruit on the bird table very attractive. Watch out for these delightful birds in your garden this winter.